Box Dimensions (LxWxH) 6.3 x 5.5 x 4.9"
Watch 42mm Smartwatch (Stainless Steel, Black Leather Band) is rated 4.7 out of 5 by 46. Rated 4 out of 5 by Dave from Except for constant pairing problems... what a watch! I hope it was just a case of bad software as I loved the watch for the 4 days I struggled to use and enjoy it. It feels great, looks great but I had to perform a factory reset each morning and sometimes later in the day to have the watch function in concert with my android phone. Each pairing effort involved one of a number of actions; factory reset of watch, restarting the watch, restarting my phone, forgeting the watch in the Android Wear app... In the end a minimum of 20 minutes was spent just to have it connect. When chatting with B&H Customer Service they advised they did not have many (?) returns of the watch so I have returned the watch for a replacement and will give Huawei another chance. Charging was not an issue, matching up on pins on the magnetic charger was easy and the charging image confirmed the connection. Rated 4 out of 5 by Bob from Very Happy Excellent quality, very bright sharp display with good color rendition. Seamless integration to Samsung S6. Holding back one star due to battery life. Real world is about 29 hours making a charging routine difficult. Android wear apps still need some polish. Configuration setting is vague and unexpected interactions occur. Workmanship and design are excellent. I have had many compliments. One future concern is battery usable life /replacement which appears to have not been addressed. Rated 5 out of 5 by Srivas from This product is a great buy. 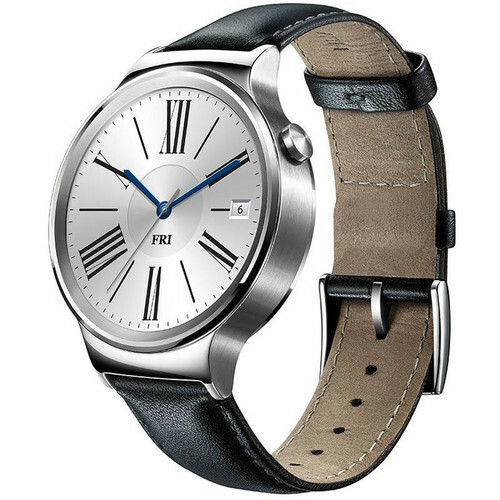 Elegant android wear watch. Very convenient to have a smartwatch as you won't have to get your phone out of your pocket for most purposes. There is a bit of learning curve though but nothing out of the way. Huawei particularly does a great job of keeping it stylish (fully circular design, variety of easily changeable bands etc) as well as powerful (AMOLED screen, decent battery, speakers etc). My only qualm is that I didn't get OTA update for very long (a week or so) and had to sideload the updates. This may be a one off thing happening now (possibly due to some server issue) but it was still irritating. Rated 4 out of 5 by Smart watch user from So far, so good. I have used my watch for approximately 2 weeks now and it has been working great. After 13-14 hours of wearing it at work it has 60-70 percent charge left, with the screen in always on mode. When using the phone, others on the other end state they can hear me clearly. The screen is a little hard to see in direct sunlight, but otherwise is great. It does noticeably reduce the battery life of my Samsung Galaxy S7. I wish it were waterproof, the directions say you can wash your hands with it, but to dry it off right away if it gets wet. Rated 4 out of 5 by Anonymous from Awesome Have a Pebble. Always wore real watches. Needed something that looked classy but still provided notifications. Huawei watch fits this perfectly. Build is high quality. Leather band is real. Have already downloaded many watch faces that at first glance make the watch appear analog but yet have tap functionality. A thing of beauty. Would give 4.5 stars but no 0.5 increments. Watch occasionally has a delay with opening an app. Also, swiping cards away is sometimes not as fluid as I think it should be. Heart rate is accurate while resting. Have not used monitor during exercise. Overall very satisfied. Rated 5 out of 5 by Shepdad from Extremely happy with this purchase! This watch was everything that I was wanting. I enjoy being able to do Spotify controls, or IFTT recipes from it. There is soo much customization you can do that it feels like It will never get old and boring. Heck I put tic tac toe and an Invaders game on it for those few minutes you need something fun to do with a small child. I put a different launcher on it because I just don't like the way Android Gear functions by default. This is definitely the watch to have right now if you are using Android. I am sure it will change soon with no iterations coming down the pipe but for the price I got it for it was a steal. I don't really care for the fitness tracking stuff so I can't relate to how well this does those things yet compared to my Microsoft Band 2. Yes it does. I usually turn it off b/c it screws up the GPS on my phone which is needed for Android auto. Is this compatible with iPhone? Can the watch face be changed to numbers instead of roman numerals on all of watches? Hi, as mentioned by others there is a large number of variable watch faces to choose from. Im sure you will find one to suit. great watch by the way!